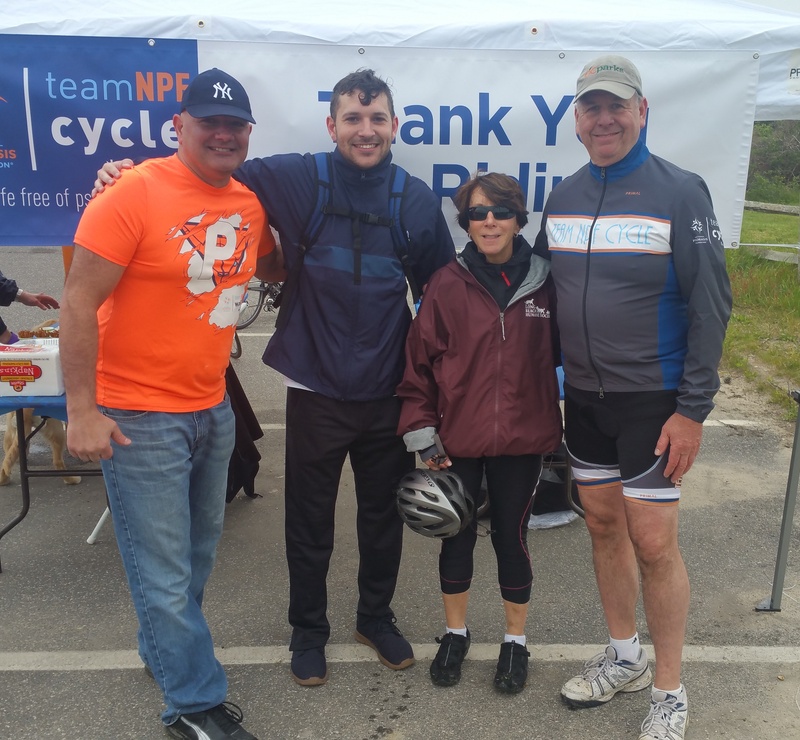 Many hours went into planning our cycle event in the Hamptons. As the outreach chair it was my job to raise awareness about the event. 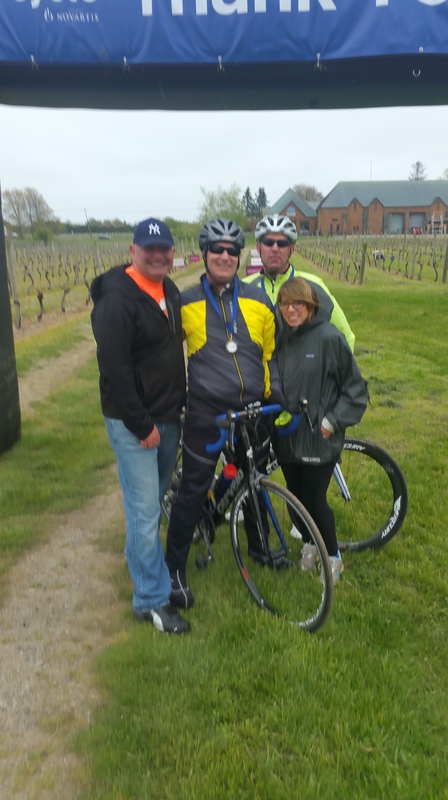 This was the second annual ride which took place at the Duckwalk Vineyard located on Montauk Hwy in Watermill. I always wanted an event to take place on the Island and I’m glad this one came to fruition. The idea came about at the inaugural ride in New Jersey. I spoke to the pharmaceutical company that sponsored that event. I mentioned that I would love to have a cycling event on Long Island and the rest is history. You heard the phrase “April showers bring May flowers”. Well somebody better let mother nature in on this. Apparently the new April is May. The weather forecast predicted 100% rain for the day of the event scheduled May 13th. It was a week out and the forecast held up the entire week. I’m thinking, “please no”. So that morning I woke up at 3am. I couldn’t sleep. I looked out the window and there was no rain. It was overcast and the morning was to remain dry until 10am. Now mind you, this is a “rain or shine” event. Well our prayers worked, the rain held off until 3pm. The cyclists that came remained dry and we’re able to complete their routes. 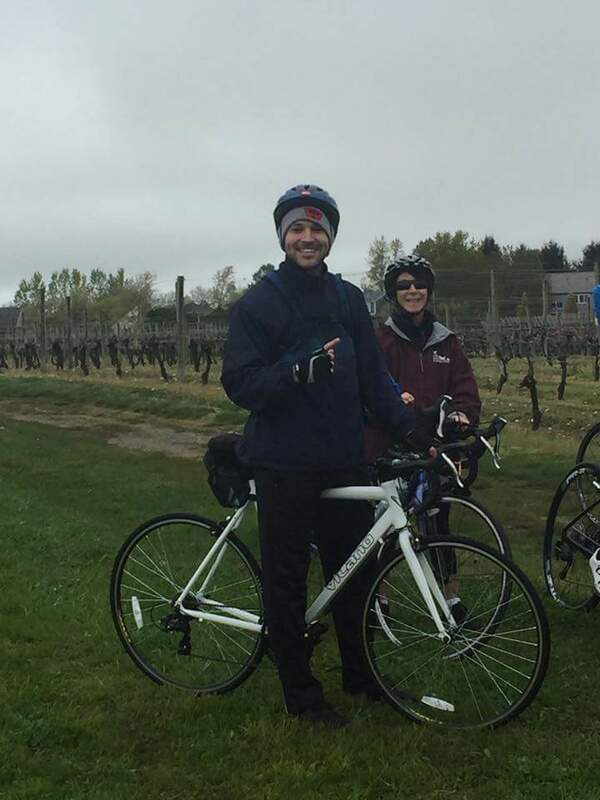 I was most proud of my son Michael who informed me two weeks out that he would ride for our cause. This thrilled me. He didn’t even own a road bike. Michael took it upon himself to order a bike so that he could participate on his Dad’s team. I wanted to ride along side of him but the foundation needed volunteers for the rest stops. I’m #pso proud of him as a Dad. This is such a great event I want to see it grow exponentially. Next year my daughter and her boyfriend will be joining us for the ride. 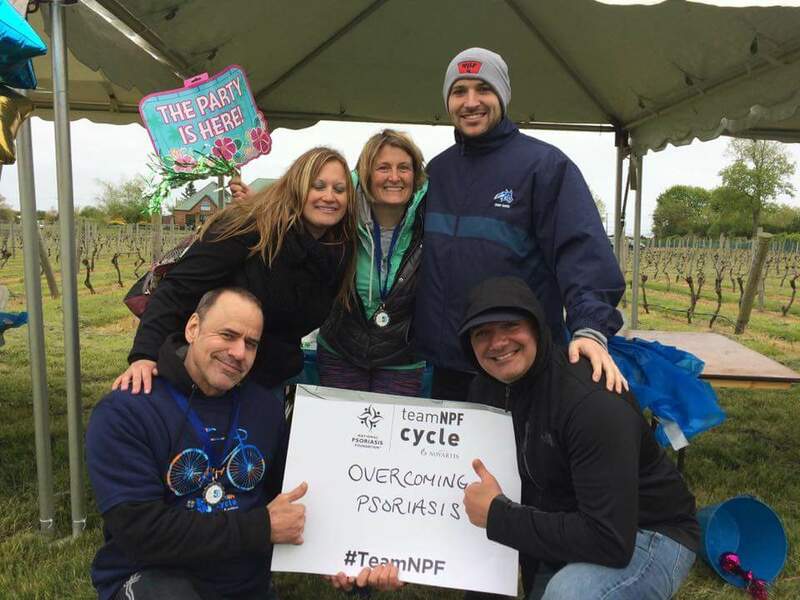 I wanted to mention all the teammates of Overcoming Psoriasis that help raise 5 thousand dollars for the NPF. They are Mary B., Steven F., Ellen, Mike and Tim B., Michael B., Jacquelyn B., Kevin, Wendy R.. I would also like to thank all those who sponsored us from our support group OP. None of this would be possible without the help from our CDM Kim S. and the cycle coordinator Kris B. and Chris P. Plus our generous board members who host the party the night before Carol O. and her husband Mike. And of course our chair Joe C. and Frank Doris and his band. Although this ride is not a race, we are in a race to find a cure. I’m sure with the help of our sponsors #Novartis, #Janssen, #Lilly, #Leo and others a cure is not out of the question. I’m looking to set a goal of 100k for next year’s event. It’s going to take a village to find a cure for this insidious disease. The funding will help scientists with research. 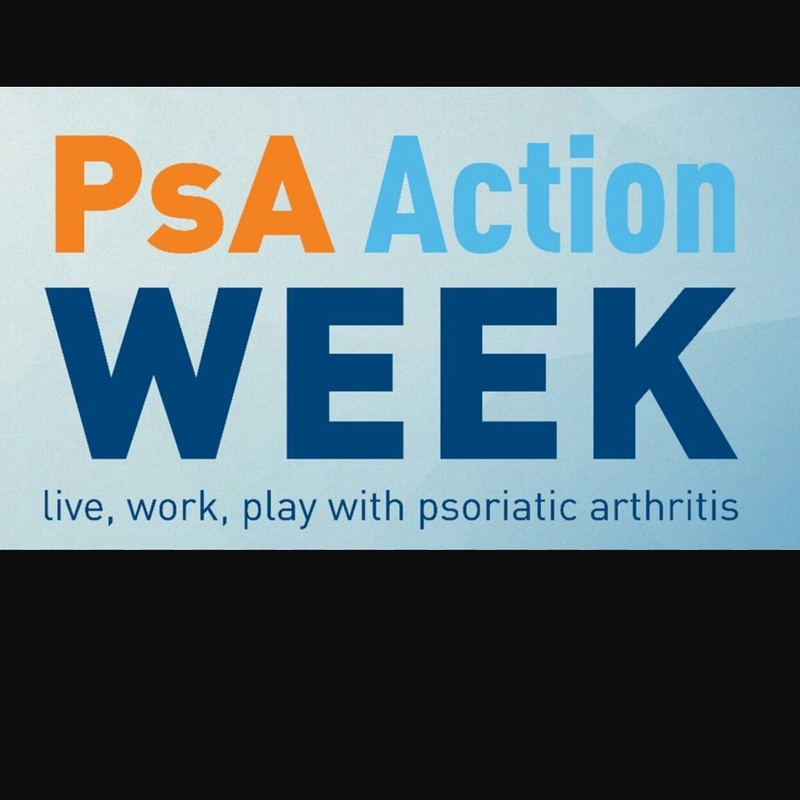 So let’s kick some psoriazz and accomplish our mission so future generations don’t have to suffer in silence. As an Ambassador for the National Psoriasis Foundation I take great pleasure raising awareness about this insidious disease. Everybody has a unique experience with this disease. Everyone’s journey is different. If your struggling with your disease I would encourage you to call the Patient Navigation Center. 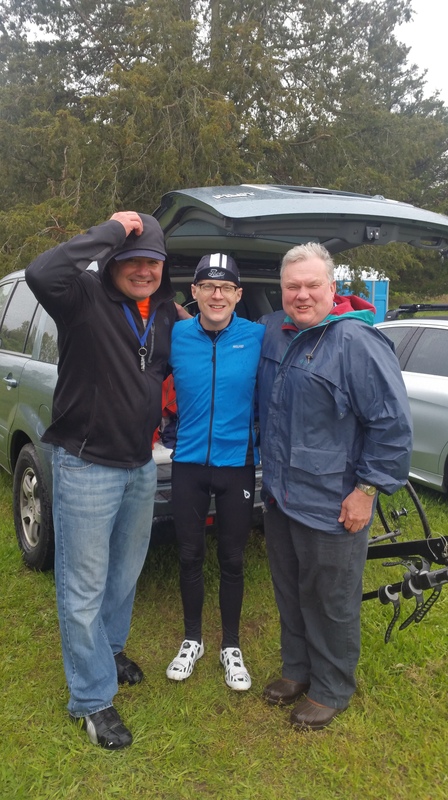 #Pso much more to talk about… As usual I will be volunteering in two cycling events this year. On Saturday May 13th in the Hamptons NY we will be pedaling for a cure. 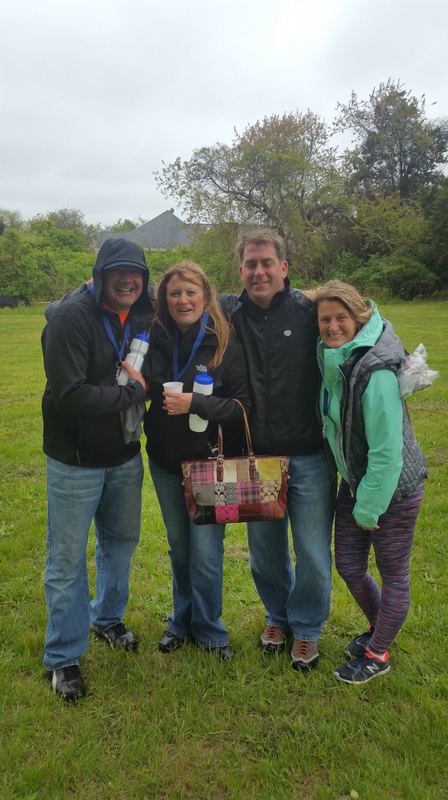 Join or sponsor our team Overcoming Psoriasis click here. This is the other ride in Ringoes NJ the following Saturday May 20th. Support team Overcoming Psoriasis click here. You’ve heard the robbers expression “your money or your life”. Well some would argue the choice, provided there isn’t a gun pointed at your head or a knife at your throat. If you are trained in martial arts and given those options, that thief most likely is going to experience the unexpected. If you’re a normal citizen then the obvious choice would to hand over your wallet. These comparisons are quite different with different outcomes. I argue the similar choices are given to an individual when they are inflicted with a serious illness. Or in my situation, a serious autoimmune disease, psoriasis and psoriatic arthritis. Psoriasis is a very frustrating and insidious disease. When I was first dignosed I had no idea what I was up against. This disease became my thief. As this disease progressed it stole more of my life as I knew it each and everyday. My ambitions and my dreams were slowly being diminished. My thoughts became “why me” and “how is this happening to me”. My only fight was to educate myself about this serious autoimmune disease and try to remedy the problem. This was like having a gun pointed at my head. It all happened so fast. I needed to become my own health advocate. 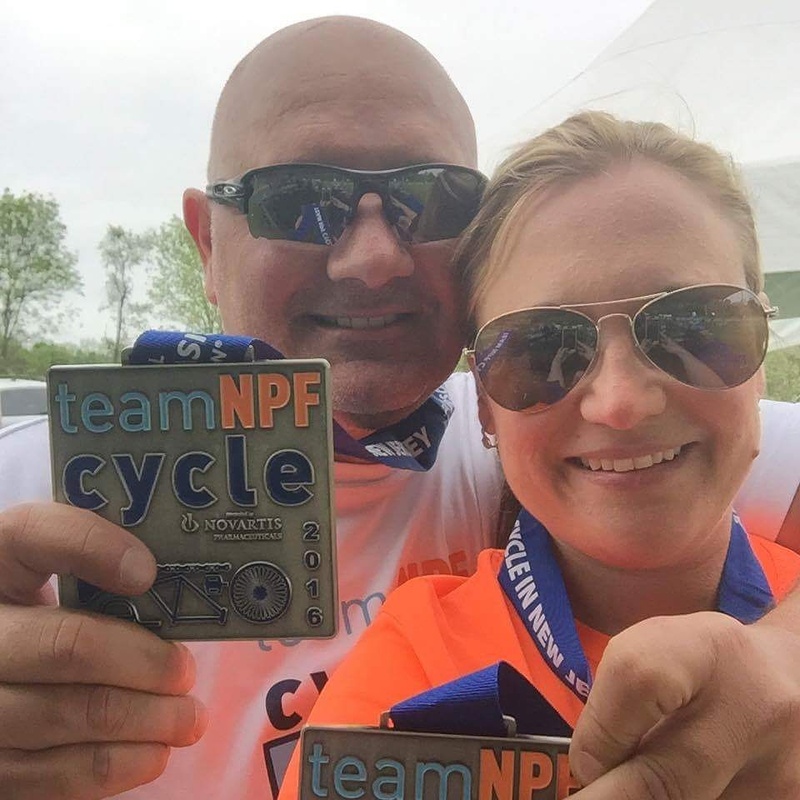 Where would I be if it wasn’t for the resources afforded to me by the National Psoriasis Foundation. The NPF has become my sensei. My new life’s lesson began over 25 years ago. This became more than just a hold up, this became a hostage situation. My thoughts shifted from personal gain to personal health. My doctor told me psoriasis was a chronic disease and there is no cure. I can laugh now thinking to myself “nah, I’ll just have the upset stomach and be done with it”, from my doctor’s health menu. How was I to support my family and juggle this relentless disease? My life was taking on water without a bilge pump. I needed to learn everything there is to know. I slowly was gaining ground on this disease. Even with all my research, I discovered that we really didn’t know much about this serious autoimmune disease that dated back to biblical times. Science needed to catch up quick if I was going to have any chance to improve my quality of life. I did everything and anything to help find relief. I even signed up for a few clinical trials. I remember saying to the physician’s assistant at the time, “imagine if we could take a shot and our psoriasis would go away”. Let’s just say this, I did a lot of praying. Let’s make a long story short. Our space is finally getting attention due to some major discoveries. I remember reading in the Advance Bulletin years ago that scientist discovered a gene responsible for our disease. This sparked my interest in science. I started reading up on and the molecular make up of DNA. TNF inhibitors, interlukins, cytokines, dendritic cells, T-cells, JAK inhibitors, heterodimeric receptors, keratinocyte proliferation. I tried reading abstracts and theories, but not fully understanding what was being said. Websites like pubmed.gov and the NIH and JAMA, intrigued me. The conversation was above my intellect. The current medication I’m on targets IL-17a. The medication binds with these proteins and eliminates the symptoms of psoriasis and psoriatic arthritis. But there is newer science that goes beyond that. Monoclonal antibody treatment targeting both the common p40 subunit and the IL-23 specific p19 subunit have demonstrated outstanding clinical efficacy. The new discoveries have me very excited. I’m looking forward for the approval of these medications that use this science. It won’t be long now that these medications become available. 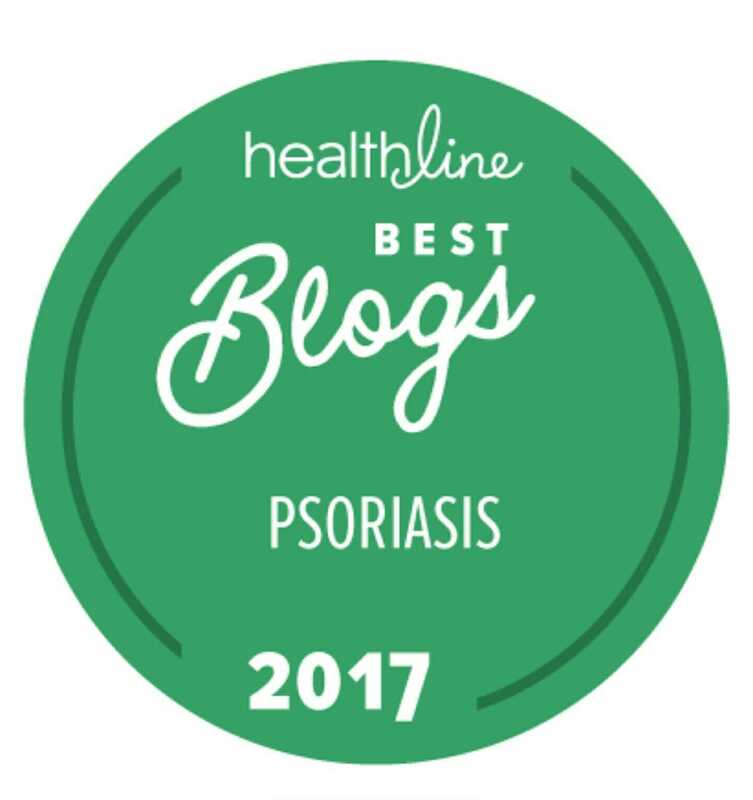 Psoriasis is a complex, multi-factorial autoimmune disease, with many complex immunogenetic contributions. Despite our increase in knowledge about disease pathogenesis and the identification of predisposing genetic risk factors in the form of SNPs, there are many unanswered questions. It is not unreasonable to speculate that in the future, personalized medicine and specific immunomodulatory treatment will be based upon genetic alterations in particular immune genes. To summarize all this, our best defense is a stong offense. In other words, we have to become our own advocate. Knowing that we are not alone in this fight. Don’t let this disease steal your dreams and ambitions. Fight back with knowledge and a better understanding of our disease. Our disease doesn’t define us. Make it empower you. Work together with your doctor. Find a treatment that works. Although our journeys are different, our goals are the same. Use all the available resources available to you. I wish you and your family health and happiness. Have a blessed day.